Russell Westbrook suffered a knee injury that would have him miss the rest of the playoffs. After this injury, the Thunder and their playoff hopes fell on the shoulders of their big star, Kevin Durant. And at that point and time, Durant was not ready to shoulder the load. He was trying to do any and everything to help his team win, but he just had not expanded his game enough to handle those responsibilities. He had enough to beat the Rockets, but they fell in the Western Conference Semi-Finals to the Memphis Grizzlies in five games. Heading into the offseason, it was not for certain when Russell Westbrook would return and many thought his absence would lead to more struggles from Oklahoma City. We never really got to witness early how the Thunder would look without Westbrook because he came back pretty early from his injury. And with Westbrook returning early, Oklahoma City served notice that they were a team to be reckoned with. But just like last year, Westbrook suffered another injury. The dynamic young point guard was again having trouble with his knee and his return to the team was not expected until after the All-Star break. And again the whispers began to come again about the Thunder falling back to the pack without Russell. But little did they know that this was only the time for Durant to obtain the glow. For those that don’t understand how Bruce Leroy obtained the glow or haven’t seen this movie, you must understand that Leroy went through some trials to get to where he ended up. He passively fought some battles with the villain in the scene, Sho Nuff. But eventually, he learned from those situations in the past and looked deep inside himself to find the power he had all along. Durant, like Leroy, is a pretty passive person in his demeanor. And to his detriment sometimes, he does not have that alpha personality that you see from great players all the time. But one thing Durant has done this year is learn from the past. 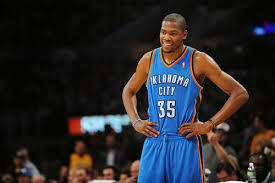 Instead of allowing the team to sink while Westbrook is out, Durant has taken the reins and taken over this team. Currently, he has led the Thunder to nine straight wins and carried the Thunder offensively with 12 straight games of 30+ points. But it’s not just that he is scoring, it’s how he is doing it. Coming down the stretch of games, Durant is coming up with any and every clutch basket that his team needs. And unlike last year in the playoffs, he is also finding ways to be a facilitator and looks more comfortable in that role. The growth of Durant is undeniable. Just when you thought that he could not get any better, he acquires a keen killer instinct. And with his play so far this year, it seems like he may be the next person to hoist the NBA’s MVP award. It’s still a long season, but the gap is starting to close between two of the best players in the NBA, Kevin Durant and LeBron James. Follow Mike Patton on Twitter at General_MP or check me out on Facebook at Mike Patton-The General . And true to his word in the press conference, he did not settle. He has guided the program to three straight bowl games and taken Vanderbilt from what some thought was a doormat to a team to be reckoned with. 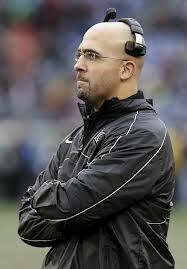 But just like the expectations and profile of Vanderbilt has risen, so has the profile of James Franklin. And now we enter another offseason of rumors of him leaving. Many thought that he would be the perfect fit for the University of Texas, but they chose Louisville’s Charlie Strong. But the chase for Franklin’s services did not end right there. The latest information has Franklin as the top candidate to be the new coach at Penn State University. So once again it is decision time for him. Will he stay or will he go? Listening to the words of former Vanderbilt defensive lineman Alphonso Harvey, he has a couple opinions on what Franklin may or may not do. When asked whether Franklin will go or stay, Harvey said he believes that Franklin will “make the best decision for him and his family”. Harvey also said: “Coaching at a sanctioned program (Penn State) is not the big time. Building a program in the toughest conference in America is.” Harvey has a point. If Franklin was to leave and go to Penn State, he would enter a situation that would be even tougher than coaching at Vanderbilt in the SEC. As Harvey stated, there are serious sanctions still on the program at Penn State that could severely hamper what Franklin would like to do. And also, the expectations that would be heaped upon him could be something that he has never seen or could be prepared for. Is he ready for to take on the job at one of the storied programs in college football? If he were to stay at Vanderbilt, he could continue to do some great things. And Franklin supporters like Vandy alum Zainab Muzzaffar feel that he should stay and be the coach here in Nashville, Tennessee. Muzzaffar stated: “Coach Franklin created magic at Vandy asnd did an amazing job. It was also our environment that was ready to embrace his ideas, his beliefs and basically let him build the program from the ground up.” If Zainab gets what she wants, Franklin will continue to be here and take a program without expectations the likes of Penn State to heights that it has never been to all the while rewriting the history books. But on the flip side of the coin, Franklin is coaching at Vanderbilt University. And although he is doing well right now, can he continue to have this type of success at Vanderbilt despite not being able to bring in all the top talents? Franklin has far and away exceeded any expectations that anyone had for Vanderbilt on the recruiting trail and on the field. But what happens when the expectation he set becomes not good enough anymore? What if things level off and the love that everyone has for him becomes frustration that the program is not progressing upward anymore? Those are things Franklin has to consider while going forward. He said he would like to bring championships to Vanderbilt and he has high goals, but the reality is that the odds are stacked against him to win an SEC championship let alone a national title. And in the end, although he is an outstanding coach, he will still not be able to bring the type of talent in that keep him competing in the long haul with the big boys across the country and the SEC. Although Penn State is not in the SEC and is not the most attractive job by some people’s standards, it still is a job that is considered big time. And in the coaching circuit, you cannot let too many chances pass when they are on the table. Like sports agent Steven Dolan of Team 31 Sports and Entertainment stated: “Franklin has to strike while the iron is hot. If not, a couple bad seasons at Vandy and he will be an average Joe.” Dolan has a point there. In the coaching business, you have to take advantage of the opportunities. And as bad as the Penn State job looks right now, it’s conceivable that he will have a better chance to win a conference and national title there then at Vanderbilt considering he can survive the sanctions that are there. These are all the things that weigh on the brain of Mr. Franklin. Hopefully in the next few days we will find out what happens and what he chooses to do. If you were James Franklin, what would you do? Follow me on Twitter at General_MP or like my page on Facebook Mike Patton-The General.